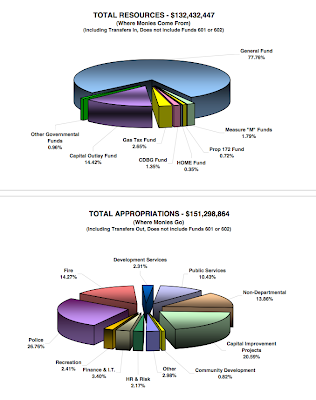 The 2013/2014 Costa Mesa Preliminary Budget document was released yesterday. You can view it - all 290 pages of it - HERE, plus Finance and Information Technology Director Bobby Young's accompanying letter HERE. I'm not going to try to duplicate what Young has provided for our consideration, but will give you some of the high - and low - lights to chew on. There will be a Budget Study Session on Tuesday, May 28th - immediately after the Memorial Day holiday weekend - at City Hall where Young and CEO Tom Hatch will present to the City Council and the public their views on this budget and their solutions to providing a balanced budget. This preliminary budget has a $12 million deficit. This budget is $157,427,623, up 18.74% from the previous approved budget. It includes more than $26.4 million in Capital projects - up 88.46% from last year! 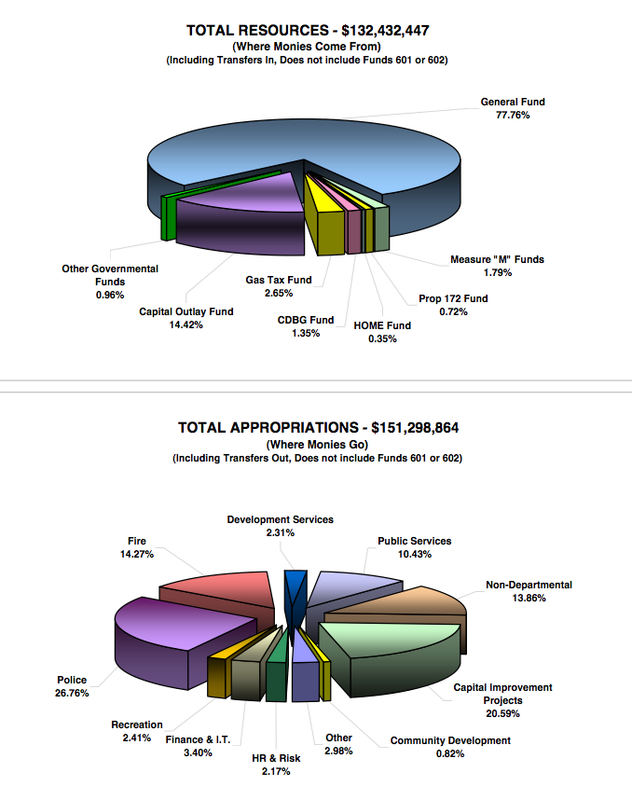 The total Capital Budget is $31.1 million, up 50.46% from last year. Clearly, the emphasis is on infrastructure, not people. Total full time employees will increase by 2, to 467, but is down by 30 from the 2011/2012 budget year and way down from the 611 a couple years ago. Part time employees FTE's (Full time equivalents) are up to 77.82 from 63.83 last year and 60.84 in the 2011/2012 budget year. Salaries and Benefits total $80.1 million, up just under $2 million from the previous year. The salary numbers are basically flat. However, the number for Retirement costs is nearly $18.8 million, up more than $2 million from last year. This is a problem that is not going to go away and the half-million being allocated to pay down that debt doesn't begin to touch it. Without some major significant changes in Sacramento and with CalPERS, the ONLY way our city - or any city - is going to get out from under the giant pension burden is via municipal bankruptcy where all previous pension obligations are wiped off the books. The costs for "Legal" in this budget is $290,500, down from $415,500 last year. However, that number doesn't include the huge legal fees we've been paying for litigation. Those numbers are buried in a line item called "General Liability". That number is just over $2.5 million, down about $100,000 from the previous year and down almost $1 million from the 2011/2012 budget year. But, the meter keeps on spinning with no real end in sight. Not anticipated in this budget is the result of current contract negotiations. The members of the Costa Mesa City Employees Association (CMCEA) are negotiating under Mayor Pro Tem Steve Mensinger's COIN scheme and nobody really knows what to expect from that process yet. Whatever numbers result from that negotiation - those employees have not received a pay increase since the economy turned south - will result in a budget adjustment sometime later this year. So, take a few hours and plow through the preliminary budget if you're interested. For an interesting counterpoint you can read Jill Cowan's piece in the Daily Pilot about Newport Beach's new budget, HERE. They receive more revenue from Property Taxes alone than Costa Mesa receives in Property and Sales Taxes combined. In a city with 25,000 fewer residents they will spend more than $100 million MORE than Costa Mesa. good to see money being spent on infrastructure rather than being an employment agency for "people". Yes, staff as necessary, outsource where you can, and don't neglect infrastructure, it is more expensive later. Too often is put off to give public safety pensions the money. quit that. I heard that they needed to add about 2 million dollars into the budget for the removal of those stupid curbs over on Broadway. Seems like a great way to spend money on infrastructure, oh and don't forget about those $ 40.00 an hour sign holders. Sign holders? How many dollars per hour would you demand to put your body out in the street with cars and trucks rushing by and nothing to protect you but an orange vest? Have you any idea how many people are severely injured every year while directing traffic around a construction site? Shame on you! ZZ Top, I don't know how or care how many sign holders or twirlers are hurt every year, but since you mentioned it, lay those numbers on all of us. According to the Federal Highway Administration, the number of work zone fatalities nationally equates to 3 deaths every day, and one work zone injury every 9 minutes. But then, these are only people, so you don't care. In CalTrans District 7 alone, 32 employees have died in the line of duty. In 2007, CalTrans lost 3 in 3 months. ZZ Top, thanks for the great info, wish there weren't any names on a list like that ,but things being the way that they are it's just part of the job. Ask any police officer, firefighter, any member of the armed forces, Cal Trans workers, pilots(private or commercial), lumberjacks or deep sea crab fishermen, they all know what they are signing up for and what the ultimate end result may be. I hope the City Council plans on hiring a full time fire chief as I hear that the current interm fire chief is done and leaving. Wasn't it just last week that the Fire Chief gave the City Council a reorgization plan for the F.D., and now he's leaving? Seems like the Council got someone to come in and give them what THEY wanted and now he is free to move along and the City and F.D. will try to work this plan. Im totally with you! Lets outsource the fire dept and have CARE ambulance service respond to our traffic accidents because they employ nothing but the finest highly skilled people that we can all depend on to save our lives in a critical traffic accident. While we're at it, lets outsource the police too and get highly trained mall cops to patrol the city. Im sure there are plenty of security guard companies who would love to give us bids. I know newport uses a guard service, lets use them! With all the money we save, we can focus on whats important like approving plans for 20 homes on the eastside for a lot that can only hold 10 homes so the developer can get rich while causing a traffic nighmare! Better yet, we can also outsource the council and city managers office to merit property management and save tons more money! Actually, arent we so broke that we need to file municipal bankruptcy? Id really like to see the city explain this one to a judge! We have a $12M deficit and yet we have a 5th floor full of highly paid spineless scum working for team riggy. How much would we save if we simply go back to being a nice city to live and get rid the unnecessary executive staff and their pensions? How much would we save if we stopped the war with employees and learn from john moorlachs mistake? How much would we make if we increased our business license tax and tax nordstrom and bloomingdale a percentage of their sales which they would gladly pay? The scumbags on council only know how to cry foul and demonize public employees. Nevermind all the tax money theyre wasting to wage their politic war. To the spineless piggy supporters: We wont forget who you are when we get our city back!